6th June 2018, New Delhi: Many restaurants across the country were actively billing a service charge in the bills till Jan 2017 when LocalCircles made a submission to Department of Consumer Affairs requesting action. Thereafter, the Department of Consumer Affairs via 2 advisories called service charge a ‘forced tip’ and an unethical business practice stating Service Charge is optional. Since about a year ago, more and more consumers have started standing up against the practice of Service Charge when visiting restaurants and asked to pay a service charge. 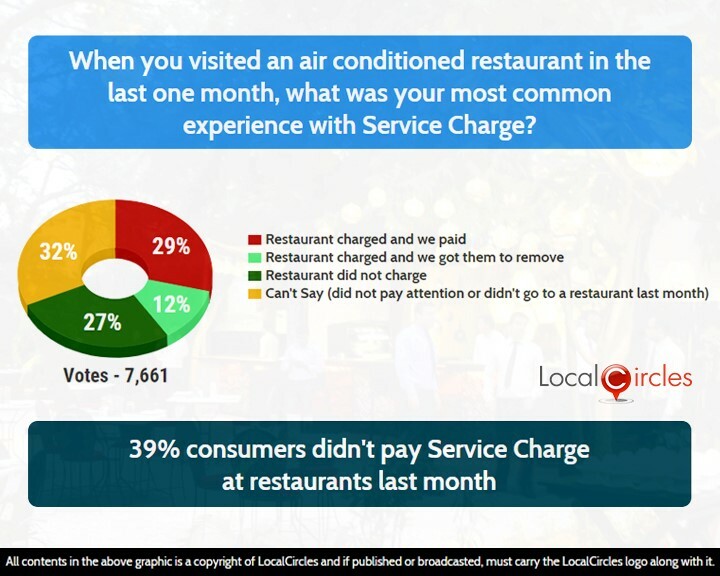 LocalCircles conducted its 5th service charge pulse check in the last 12 months and asked consumers what was their most common experience with service charge when they visited an air-conditioned restaurant in the last 30 days. 29% said restaurants charged and they paid it and 12% said restaurants charged but they got it removed. 27% said restaurants did not even levy service charge while 32% said they either did not pay attention to the bill of did not visit a restaurant in the last month. This poll received 7,661 votes. Many consumers are of the opinion that they do not mind paying a tip if they are served well but forcing them to pay a service charge ‘mandatorily’ is something that they would not like to do. Recently, a consumer dragged a Mumbai lounge bar to consumer court to refund the service charge he was forced to pay. The District Consumer Dispute Redressal Forum ordered the lounge bar to refund the service charge it had wrongly charged to the consumer. They were also asked to pay Rs. 5000 as the legal cost and another Rs. 5000 as damages for causing mental agony to the consumer. 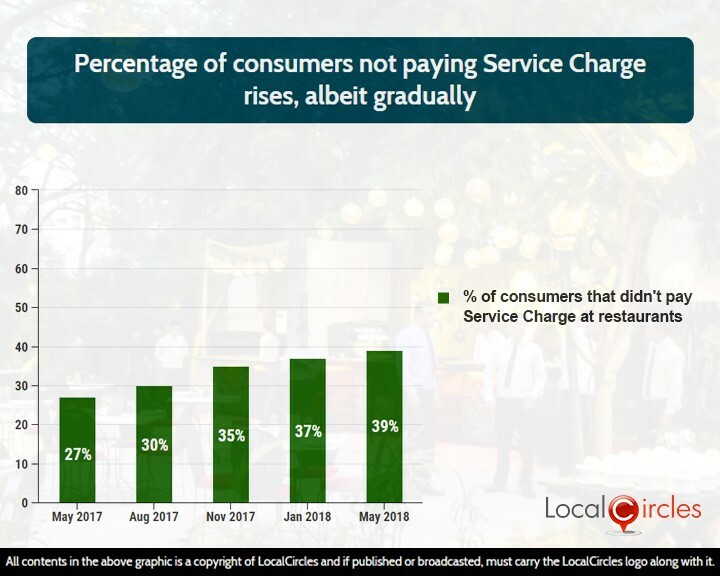 The percentage of consumers not paying service charge has also been gradually rising. Statistics show that the number that stood at 27% in May 17 increased to 30% in Aug 17, 35% in Nov 17 and then to 37% in Jan 18. It stands at 39% as of May 2018, showing a slow yet steady improvement. Consumers believe that if the Central and State consumer departments actively create more awareness about Service Charge being optional within the restaurant association and owner community, the cases of levying of Service Charge will further reduce.